Hunter Shepard grew up in Cohasset, Minn., with a goal of wearing maroon and gold. He is, as living the dream has turned out better than the junior goaltender for Minnesota Duluth could possibly have imagined. 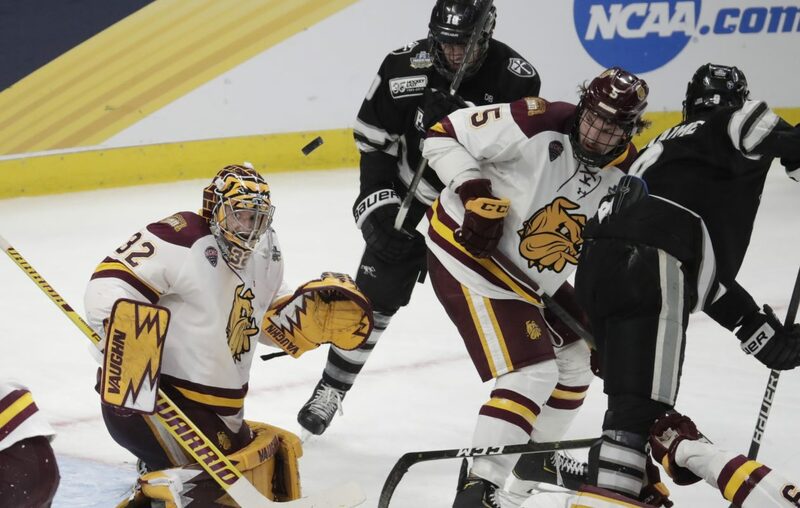 He leads the defending national champion Bulldogs onto the ice Saturday night in KeyBank Center where they will try to complete the repeat against upstart University of Massachusetts (8:09 p.m., ESPN2 and 550 AM). This is Duluth’s third straight national championship game. It looks to become the first team to win back-to-back titles since Denver in 2004 and 2005. Most players would give almost anything to have a chance to compete in one national final. But three in a row? That is has been for the 6-foot-1 undrafted and lightly recruited Shepard. Helping a team win a national championship is impressive on its own merits. That’s not the only attention-getter on his resume. Shepard holds program records for shutouts in a season (eight, 2017-18) and career (14). He ranks fourth in UMD history in career wins (53), just seven away from the top spot. The first team All-American has made a school record 80 consecutive starts. He was a finalist for the Mike Richter Award given to college hockey’s most outstanding goaltender. Shepard is pretty pleased his career path guided him to UMD. Of course, his desire as a youngster to wear maroon and gold as a collegian had nothing do with Duluth. He grew up a fan of the other University of Minnesota – Twin Cities, which also has the same colors as Duluth. His love affair with the Golden Gophers began 17 years ago when he attended a daycare operated by the mother of then Minnesota starting goaltender and NCAA Tournament champion Adam Hauser. As a youngster, he caught softballs with a goalie glove in the Hausers’ living room. The Gophers, along with every other program with national-title aspirations, loss turned into UMD’s gain. The Bulldogs were the only program from a major conference that offered Shepard a chance at his dream: to play for a team that had a shot at contending for the NCAA crown. What did UMD coach Scott Sandelin see in Shepard that made him think he’d be a good fit for his program? Folks watching Thursday’s national semifinal win over Providence witnessed that first hand. With the game tied 1-1 early in the third period, the Friars had a 5-on-3 power play for 1 minute, 24 seconds. Shepard made four of his 28 stops during that disadvantage for the Bulldogs. UMD advanced with a 4-1 win over Providence. The Bulldogs, who have 14 returnees from last year, hope to answer the challenge one more time, this time against a young, fast team with speed that has nothing to lose in first-time finalist UMass (31-9-0). “If bring our game, play the way we need to play for 60 minutes, I think we'll like the outcome,” senior UMD forward Peter Krieger said.